More than anything, the shift of the Magnetic North Pole affects navigation systems containing magnetic compasses. While modern smartphones, vehicles, ships, and airliners are connected to satellite-based navigation systems, like GPS and GLONASS, their receivers don't provide a sense of direction, rather, only a person or vehicle's fixed location. As a result, navigation systems' magnetic compasses, or magnetometers, are used to provide an accurate estimate of the direction a phone, vehicle, ship or plane is pointing in using what's known as declination – the difference between true north and the direction of the compass. If the mathematically expected location of the Magnetic North Pole is wrong, navigation equipment will be off kilter. 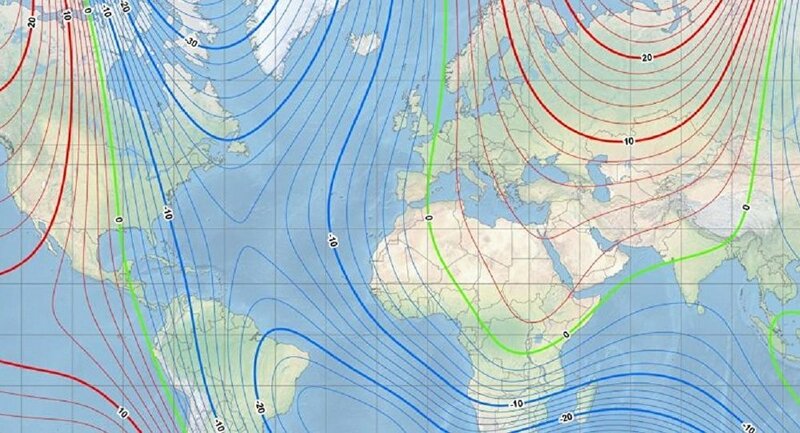 For this reason, the recently announced update to the World Magnetic Model, the mathematical foundation for navigation which allows magnetic north to be precisely fixed, is crucial, and could not have come a moment too soon. Accounting for the shift in the pole's location is particularly important in areas above the 55th parallel, which covers northern Canada, Scandanavia, and much of Russia. For most civilian purposes in Western Europe and North America, British Geological Survey geophysicist Ciaran Beggan says the changes would be relatively minor. "The average user is not going to be overly affected by this unless they happen to be trekking around the high Arctic," he told National Geographic. However, militaries, commercial airlines, search and rescue ships and aircraft, NASA, and other agencies and groups relying on precision navigation in the high north should find the update helpful. While they are expected to recover, the shift may result in scenarios of birds falling out of the sky en masse, and fish dying off in large numbers. And while most scientists believe this shift will not lead to any catastrophic mass extinctions, the scenes may be frightening, looking something like the pictures of thousands of dead birds and fish in Arkansas in 2011, which some scientists thought may have been related to animals' sensitivity to changes in the Earth's magnetic field. A more serious possible consequence of the "tug of war" between magnetic field patches in northern Canada and Siberia, which some scientists say is causing the accelerated movement of the magnetic north pole, is its potential to weaken the magnetic shield sparing earth from deadly solar and cosmic radiation. This could lead to increased rates of cancer in humans, or harm man-made infrastructure projects, such as power grids. However, scientists say that even in the scenario of a flip of the north and south poles, which isn't expected to happen anytime soon, the shift would be protracted, taking as much as a thousand years to complete. This, hopefully, will help mitigate its effects.